Yo! What's the haps? : 100% Certified Nerd. I've got the allergies to prove it. 100% Certified Nerd. I've got the allergies to prove it. Once I was at the doctor and he stuck that flashlighty thing up my nose to have a look. He told me I had an "allergic nose". At that very moment I thought, "Awesome. I wonder if I put that on my resume if it would help me get a computer based job..." I also thought, "Awesome. I AM NEVER GOING TO GET MARRIED." The point is that I have lots of allergies, which never seem to leave me alone. However, I have recently discovered another one and it may have the potential to actually be beneficial! That's right friends, I am allergic to work! No joke! Over the past few months I have noticed that the frequency of daily sneezes is at an increased rate when I am at the workplace, vs. when I am at home. This is weird, because there are cats in my house which I am TOTALLY allergic to. One would think that I would sneeze more in the presence of a known allergen which causes my eyes to swell up if I touch them and then touch my eye. So why am I sneezing so much at work? Because I am allergic to work, OBVIOUSLY. You are a nerd! But I love it. Thanks, Brie. That means a lot coming from you... cause you know, nobody loves nerds like librarians! 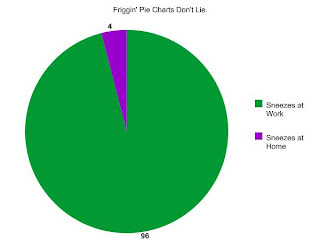 friggin pie carts DON'T lie. er... that was a pie CHART.